Paul Hicks (Conductor) is from Lockport, Louisiana. He earned a Bachelor of Arts degree in Music in 1986 from the University of Southwestern Louisiana in Lafayette and a Master of Music in Trombone Performance in 1988 from Sam Houston State University in Huntsville, Texas. 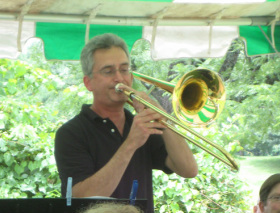 Paul served four years playing trombone in the Air Force Band of the West in San Antonio, Texas. He pursued a doctoral degree at the University of Illinois at Urbana-Champaign for three years, and then, one year later, received his Virginia Teaching Certificate from James Madison University. Paul has taught middle and high school band in public schools in Louisiana and Virginia and has taught at Marshall Middle School since 2001. His bands have consistently received Superior or first place ratings at competitions since 2008. In 2007, Paul was nominated for the Agnes Meyer Outstanding Teacher Award sponsored by The Washington Post. Paul currently lives in Winchester with his wife and three children. Katrina (Katie) Bryant (Assistant Conductor) hails from northern Maine, where she studied Piano Pedagogy and Geology at the University of Maine for four years before completing her Bachelor of Arts in Music at the University of New Hampshire. Katie has been teaching private piano lessons and playing in weddings since she was in high school. Since then, she has worn many hats, as a band director, choral director, vocal accompanist, hand bell choir director, and church organist. Katie joined the Fauquier Community Band in 2015, after relocating to Virginia. These days, in addition to playing with or conducting the band, she enjoys teaching piano lessons around her schedule as a homeschooling mother of four.